As Islamic State forces invade and take over 90 percent of Yarmouk camp in Syria, residents of the camp reach out to the world pleading for their voices to be heard. They are demanding that the Palestinian Liberation Organization and humanitarian organizations such as the Red Cross and UNRWA act in order to secure a safe exit passage to save the remaining 18,000 residents in the camp. Yarmouk camp once was hailed as the capital of the Palestinian Diaspora with over 160,000 Palestinians in the camp. In December 2012, the Syrian regime began imposing a siege on the camp, which has resulted in the direct death of 200 Palestinians. In addition to that, over 1000 were killed due to the continuous shelling, attacks on the camp and torture in regime jails. 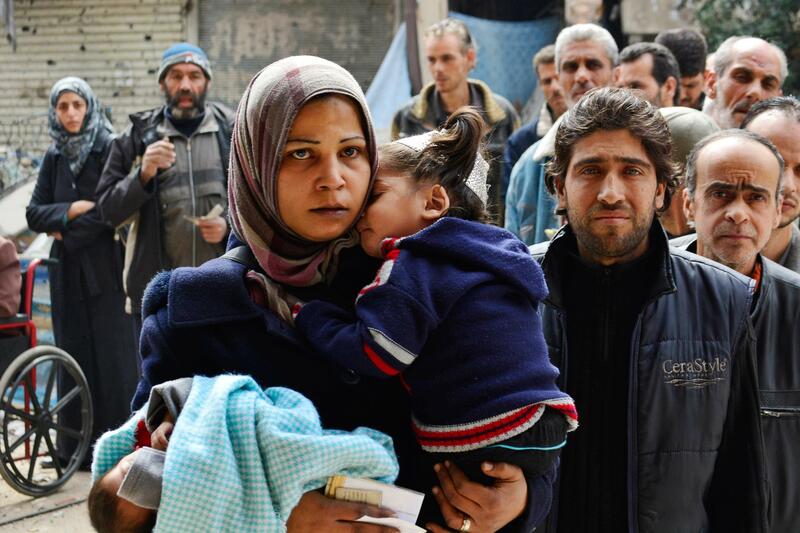 To add onto the siege which has lasted over 700 days, residents in al-Yarmouk are now struggling to survive in the face of assaults by IS forces and their allies. Through the use of social networks, mainly Facebook and Twitter, this ongoing offensive and monstrosity is being recorded through the voices of those in the camp. These posts are not present to record a story, they are attempts to utilize the tools present in order to seek help from organizations that pledge to secure human rights for all. More specifically, organizations that speak on behalf of Palestinians especially Palestinian refugees. H., whose name is changed due to security reasons, has been speaking about the situation of the camp asking for outside assistance since the imposition of the siege, one that was perpetuated by the Syrian regime, its allies in the camp and the silence from the international community. He now records his sentiments through Facebook statuses as they range from cynicism to despair to conveying to the outside community his situation and that of those surrounding him from the camp. In one of his posts, H. explains his resentment towards those who have been silent regarding Yarmouk stating: “Yarmouk, did we not tell you to not trust anyone? Because even your shadow leaves you in times of darkness.” This was posted a day after the takeover of the camp by IS forces. After the invasion by IS many individuals began making efforts to mobilize in order to highlight the plight of Yarmouk and the imminent danger surrounding it in attempts to stop another massacre from happening. As the camp called on the international community and the Palestinian Liberation Organization ad infinitum to intervene when the regime-implemented siege began they were met with little mobilization and a piercing silence. Today they endure yet another travesty as IS forces take over the camp and Jabhat al-Nusra assists in the onslaught. The PLO must take a stronger stance on Yarmouk, and engage in active talks with all organizations responsible to ensure the safety of those that remain within the camp. The UN Relief and Works Agency (UNRWA) and the Red Cross also have a duty towards the residents of the camp, most of whom are refugees. This is not the time just to lament what is going on in Yarmouk, this is not the time to put our heads into our palms and pity the residents in the camp. Their endurance and their will to live should mobilize us to take action, to invest all of our energy in attempting to save the little that is left to save in Yarmouk. The camp is gone, but the lives remain. They are not numbers and it is our duty to work through any means possible to ensure their safety. The Jewish state in cooperation with Saudia has supported Al-Nusra, that much is known to be true. They are well and truly behind this attack on Yarmouk camp. Our voices were drained whilst we kept calling Yarmouk. Now everyone loves Yarmouk? I know it’s no time to shame, but it was you that partook in our besiegement. Thanks, Mariam, for the update. Looks like ISIS is “mowing the lawn” too. I guess at this rate there will be less Palestinian refugees who might have the right to return to their ancestral lands. What a sad and hopeless situation. The world seems indifferent to what happens to the Palestinian people. They are the real victims that need urgent help, support, and protection, from these violent, armed criminals. Other than your hatred of the Zionist regime I don’t think you can back up any claim that Israelis wish for the victims of Assads regime anything but alleviation from their suffering. It’s well known that for political and other emotional reasons the PLO rejected ANY help offered by Israel and if you go back two years in the conflict there was no way to predict that a predominantly Sunni group would attain power like or has and wreak as much pain and murder on yarmouk as Assad has. People here like to pretend Israel is”buddy buddy” with IS because it provides limited medic assistance to some in nursra. But the truth is Israel could not remain completely neutral with Iran/Hezbollah I it’s north and even it’s enemies understand why this is. It has absolutely nothing to do with there being “less” refugees to return. Israel isn’t budding on ror and the current Palestinian claim is more then 5 million so it’s absurd to think a that the suffering of Palestinian civilians in what was Syria is a motivating factor for idf. If anything, we would have preferred that these civilians been granted dual Syrian-Palestinian citizenship years ago so the camps would have been moot. It still amazed me that with all the things Israel CAN be blamed for that MWs continue to blame Israel for just about everything. Actions speak louder than words Bakr, so does history. Are you stating here that Israelis have shown nothing but compassion and concern for those Palestinians? Last time dear loving Israel slaughtered civilians in Gaza the polls showed that the majority of those kind hearted Israelis not only wanted Israel to use more force, but their equally compassionate leaders called for Gaza to be flattened, bombed back to the stone age, and one even called for concentration camps. So don’t pretend otherwise, and try to portray the majority of Israelis who wants Netanyahu to continue the violence, and do not give a fig for Palestinians, to be suddenly caring about those refugee camps. PERHAPS IF THEY REALLY CARED AS YOU SAY, THEY WOULD HAVE GIVEN THOSE REFUGEES THE RIGHT TO RETURN TO THEIR ANCESTRAL LANDS, AND GIVE BACK THOSE STOLEN FROM THEIR FAMILIES. All that and you expect me to love the zionists? Okay as soon as they end the occupation, land theft, and stop the slaughter, I will adore them, how about that? your just giving me talking points about Israel and Hamas-not anything about Israels position on its northern frontier with (the in name only) Syria. No other capable nation on earth would stand idly by with assorted, various and unpredictable hostile forces on its border. And..
You are in for a rude shock. Here are other sources backing HRW, and surely you don’t think the US state Dept, and a Ret. Israeli Hight Court Justice was “funded: by anti Israeli/anti Zionist money? Give it up, there are many sources that back HRW and dismissing it as funded by anti Israeli money is simply lame, lame, lame. According to the 2004 U.S. State Department Country Reports on Human Rights Practices for Israel and the Occupied Territories, the Israeli government had done “little to reduce institutional, legal, and societal discrimination against the country’s Arab citizens”. Always go to the source of Palestinian misery and suffering and the ongoing Nakba. And, let us never ever forget it. i did not deny there were no discrimination issues with Israeli Arabs but they have a Supreme Court that is not just a rubber stamp court of a 2-bit tyrant, head Mullah, or tyrant general and has been making decisions favouring civil rights for many years. I am not sure if Palestinians have a system like this in any other Arab nation. Yes, and aren’t the Israeli Supreme Court’s decisions routinely ignored by the IDF and the government and civil authorities? Yes, and from regimes in host countries too and they also need protection from Palestinian militias. They’ve been getting it from friend and foe for decades. They especially need protection from their brutal, well armed, and US supported occupier. ISIS is the recent threat, but their occupier has been the biggest threat for decades. I agree..!! It’s most sickening. Both ISIS and Nusrah have strident sectarian/religious profiles. Can anyone enlighten us about the sectarian/religious mix of the camp residents? Sames as ISIS and its Nusra associate, otherwise it would not be under a Syrian Army siege. Does it matter? All religions forbid killing of people. End of. No justification no matter what religion. It’s blasphemy of God. Any idea about what percentage of the remaining civilians are not part of the insurgents’ families? Of the 18,000 remaining residents, SANA reported that 2000 have left in the past few days. Yarmouk are Palestinians so mostly Sunni Muslim. This isn’t religious though. Yarmouk in the early days of the war was troublesome for Assad mostly trying to stay neutral and be uncooperative. Other Palestinian groups, particularly the PFPL-GC were furious feeling that Assad’s / Alawites had backed the Palestinian cause to the hilt. There were some limited skirmishes between Yarmouk and PFPL-GC forces. There are definitely some supporters of al-Nusra in the camps who have cooperated with them but I’d say on balance most of the Palestinians just want to escape having to fight for either side. Today they are being attacked because they are neutral. They aren’t firmly under Assad’s control while at the same time Yarmouk is very close to Damascus (essentially a suburb). Strategically it makes sense for al-Nusra to hold it, and it makes sense for Assad’s forces not to allow the people of Yarmouk to give al-Nusra a base of operations. I’d assume ISIS is going to take the camp for its geography. What they are going to do with the civilians likely depends on if they show any resistance or cooperate. Israeli lawmaker Ahmed Tibi called the takeover by the Islamic State of the Yarmouk Palestinian refugee camp “a crime against humanity” on Monday. Tibi, a member of the Arab Joint List party, said the international community, and Arab countries specifically, bear responsibility for allowing the violence in Yarmouk to occur. It’s a tragedy. It’s all part of the ongoing Nakba. It’s all part of the ongoing international complicity in Israel’s multitudinous crimes against Palestinians and humanity. It seems ISIS is doing the dirty work for Israel in this refugee camp. While Israel massacres in Gaza, ISIS is mowing the lawn in these Palestinian refugee camps. The less Palestinians to claim their rights and lands, the better for the occupier. Oh no. Oh, no. Where have we seen this before? This is further proof of the terrible blunder of 1947 when the Palestinians rights were so cruelly removed and they became dispossessed of everything. The rest of us should feel utter shame for that act and what has happened since to these poor people. Come on UN – get something doing to put this right – all of it! NOW! Show us what you’re made off any why you are supposed to exist! What on earth have the Palestinians done to deserve this further atrocity? This injustice done to the Palestinians was the responsibility of the UN/UK/US, and it is their responsibility to correct that HUGE mistake – but they still seem to be devoted to helping their occupier continue the occupation, land grabs, and getting rid of Arabs from their own lands. Those responsible know no shame, unfortunately. “At a time when Yarmouk refugee camp near Damascus has come under renewed attack from both Syrian military and ISIS forces, and thousands of inhabitants are cut off from food and medical aid, it seems appropriate to highlight narratives from Palestinians who have witnessed and endured the ongoing violence in Syria. “This movie is about the Palestinian refugee camp “Yarmouk,” when it was attacked by the Syrian regime’s MiGs, on 16 December , as punishment for sheltering displaced Syrians and Palestinians who had lost their neighborhoods due to previous attacks. Nothing about Khaled Mishaal and Hamas’ role in aiding the insurgency, which was attacking Damascus from the shelter of Yarmouk. Nothing about how the insurgents’ takeover of the camp caused the vast majority of the residents to flee. This is a variant on the many propaganda pieces about the secular, non-violent, artistic activists who were forced to take up arms (conveniently pre-purchased from gun dealers in Lebanon) in response to the regime’s brutality. I find it interesting that in this article hardly anything is being said about making common cause with the Syrian government – and the Syrian people – who have been subjected to a brutal campaign of regime change by a collusion of American neocons, Israel, Saudi Arabia and the Wahabi infested portion of the Arab world. The best way to bring a solution for the problems of yarmouk is to strengthen the hand – and work jointly with the Syrian Army, now fighting against the ISIS foreigners injected into the midst of Syria. I find it curious that there is so little mention of the obvious and instead we get these appeals to the UN. Especially since Syria has done everything possible to help Palestinian citizens leave the camp, even as they were being held hostage by the various groups fighting over control there. The most recent stories before this “Isis invasion” were about the different camps in Yarmouk having reached an understanding with the Syrian government to lay down their arms and curtail the more extremist elements in the camps that caused it to be besieged in the first place. One finds it very interesting that shortly after news of an agreement being reached that suddenly ISIS find a way into the camp by mysterious means. Who let them in? how did they manage to gain partial control there? who has an interest in sucking Palestinians into the “regime change” paradigm promulgated by Neocons, Israel and their wahabist criminal bretherns in the KSA? It is clear that right now the ISIS front – and their Israel-aided al Nusra terrorists are suffering serious set-back in the Qalamoun mountains and near the Golan hieights. Is it a coincidencne that suddenly we are seeing a coordinated attack on Idlib and this mysterious “injection” of ISIS into yarmouk? I think everyone who cares about the Palestinian cause would be well advised to look very carefully at the events unfolding in Syria. It is time to put the pressure on the real culprits: Israel (which is arming and supporting al-Nusra), Saudi Arabia that brought ISIS about and is funding them as we speak (while pretending otherwise) and the US which made no secret of wanting to demolish Syria as an independent country through one of their atrocity-generating regime change operations. The solution to the yarmouk problem is staring at us all in the face. Advocating some UN “intervention” when it is the very same militant factions allied with nusra salafists and Isis that have been preventing the entry of UN aid in the first place. Anyone else notices the strange contradictions and coincidences here? this reminds me of what happened at Nahr al-Bared in 07. Thanks Annie for the reminder about al-Bared. The similarities to Yarmouk are indeed striking. The ISIL militants stormed the camp on April 1, apparently in tandem with rivals from the al-Qaeda-linked al-Nusra Front, even though the two groups have fought bloody battles against each other in other parts of Syria. The terrorists attacked Yarmouk, home to Palestinian refugees since 1957 and located on the edge of the Syrian capital, in an attempt to kill a reconciliation deal between Palestinian armed factions inside the camp and more moderate groups seeking to keep the site away from the crisis in Syria. “In Yarmouk, there are many different armed groups. They do not want solutions. Nusra Front implements a foreign agenda just like ISIL. Nusra Front along with other extremists are the ones who facilitated the entry of ISIL from Hajar al-Aswad (district), into the camp,” said Abu Kefah Ghazi, a member of the Popular Front for the Liberation of Palestine – General Command (PFLP-GC), in an interview with Press TV inside the camp on Saturday. Members of a Palestinian faction called Aknaf Beit al-Maqdis are the main fighters engaged in ferocious skirmishes with ISIL in Yarmouk. They had signed a peace deal with rival Damascus-backed Palestinian groups before ISIL’s attack on the camp. Aknaf Beit al-Maqdis fighters are now battling alongside members of those pro-Syrian government Palestinian factions against ISIL terrorists. +100, and thank you, Danaa! The list of Americans that helped bring upon this disaster is long indeed. “It is bitter and tragic. Assad is no prince, but he’s not the evil and dastardly devil that the US and Israel and others made and make him out to be. Just, he’s a few notches below; he tried to outsmart a valid opposition that had risen against the regime by offering long overdue and honest changes in a new consitution. When the new constitution was released, the people saw that a spitball had been thrown at them, which played perfectly into the hands of those foreign powers that wanted him deposed. As to the stories going around Yarmuk, the great invincible army of ISIS fighters that are poised to take on the 500,000-man Syrian army, these ISIS fighters number about 200 are probably equally scrounging for food and water in the almost totally-destroyed camp. They are surely finding mostly favourable fans among the remaining camp refugees as otherwise, the 18,000 Palestinians would have fled along with the 130,000 that did. There’s a huge campaign underway to garner world support for some king of UN/US/NATO/PLO offensive to take out Assad based on what’s happening in Yarmuk. Everything else has failed. After 4 years, Yarmuk is now news. Walid, I see you subtracted the 2000 that fled Yarmuk from the 20,000 that were supposed to be still there. It is, of course, possible, that some may not find it so easy to leave, even if they wanted to. I read somewhere that one issue faced by the Syrian arab army is that the government is prohibited from entering Palestinian camps by some law they signed onto. That makes it impossible for them to do anything other than lay siege to the town. Still, I am curious – how did those 200 ISIS people slip into the camp iof it is guarded from all sides? who slipped them in and why? if you hear or read anything, please share. Phil, please stop publishing these reactionaries. Since you admire Mearsheimer and Walt so much, re-read Part II: The Lobby in Action; Ch. 9: Taking Aim at Syria (pp.263-79). This was what the neocons and Israel Lobby had set up for Syria as of 2007. Eight years later, the disaster in Syria is the result of “soft power” Middle East politics of neolibs in State, CIA and Military as set in motion by the likes of Clinton, Petraeus and Panetta. Most MSM reporters (even those who managed to search beyond their interpreters’ friends in Beirut) have complied with the narrative pushed by Israel, Qatar and Saudi Arabia. I tend to agree Rusty Pipes. I sure wouldn’t want to see MW get sucked into this quagmire where regime change operators with bloody hands one day masquerade as humanitarians the next. This entire campaign against Syria has long ago stopped being about Assad per se. It most certainly is not about any legitimate opposition to Assad and decidedly not about a “democratocracy-US-style” (the kind that brought the banderites to power in Ulraine. Isis here, neo-nazis there, what’s the difference?). I do not know the history of the writer of this article and I would like to assume the intentions are good, except for that nagging little doubt – the timing. Something quite not right about the timing. To me, the ISIS entry into yarmouk (aided by whom, exactly? ), its timing and any atrocities they are likely to perpetrate smell like another type (a particularly odious type) of a false flag operation. Like all false flags, certain people and writers and activists are handed their talking points, the calls of “gevalt!” go to the UN, action is solicited, ink is spilled on-line as blood sinks to the ground on location. Somehow, I keep thinking that maybe the “chlorine” charges didn’t stick at the UN, so it’s on to Plan B (or is it Plan C, or Plan D?). Why do I get the funny feeling that these ISIS people can be turned on at will, where needed to precipitate calls for a little “humanitarian” help – be it in the form of foods or bombs (the regime changers honestly could care less which one it is, though bombs may be cheaper and with easier delivery). But back to the point: things are certainly murky over at Yarmouk in many more ways than one. I think MW is well advised to stay clear and away until the dust settles. Maybe it has something to do with a mild-mannered and shy company clerk and mosque cleric that was picked up in a US dragnet in Fallujah in 2004 and kept at a medium security military prison at Camp Bucca in Iraq where he was released after 6 months and eventually transformed into an an Attila the Hun type going under the nom-de-guerre of Abu Bakr al-Baghdadi, Caliph of ISIS. The turning on and off feature was fine-tuned by Bush II that would take Bin Ladin out of mothballs whenever needed. Posted it here about a month or so back; I have to dig it up. US claims to be waging war against “Islamic State” whose various “al-Baghdadi” leaders do not exist. The admission by US military leaders, reported in the NYT, reveals that the so-called “Islamic State” was nothing more than an appendage of Al Qaeda – with Al Qaeda itself directly armed, funded, and backed by stalwart US allies, Saudi Arabia and Qatar. Despite the NYT and the Pentagon’s admissions, the entire ruse has continued, on an exponential scale. thanks for the links mrw. i’d read the reports he was psyops and recall at the time they killed him off more than once. but i’d never heard he was a clerk. Do you still have the link for the Presbyterian Church published presentation about the I/P conflict. It was a couple of years ago. Cost about $20 or $25. A really professional package. … This isn’t to suggest there aren’t many intensely religious ISIS fighters, including Baghdadi, who has a doctorate in Islamic studies and reportedly used to preach. The bloodthirsty leader of the Islamic State was once a secretary working in office admin, newly released documents have revealed. Brutal Abu Bakr al-Baghdadi was captured by American soldiers in 2004 in Iraq, and records from the time have revealed his life before he turned to terror. The declassified documents show that al-Baghdadi – registered under his real name of Ibrahim Awad Ibrahim Al Badr – was held for 10 months in a military prison in the south of the country. The terrorist’s status was listed as ‘civilian detainee’, which means he was not then officially thought to be an insurgent. His occupation was written as ‘Administrative Work (Secretary)’. He was registered as married, and an uncle is listed as being his next of kin – although all of his relatives’ names have been redacted. It is believed he was detained during a raid aimed at arresting his friend, named as Nessayif Numan Nessayif, in Fallujah. The records, obtained by Business Insider, were released through a Freedom of Information Act request. Although his date of birth is also redacted, he is believed to be 43-years old-and has a wife and a young son. Friends of al-Baghdadi have previously told of how he was a talented footballer, with one former team-mate even describing him as the ‘Lionel Messi of our team’. He was also remembered as a shy and unassuming young man who was interested in religious studies, before his radicalisation to a dangerous extremist. Could this tragedy have been averted? “Israel agreed to allow 150,000 Palestinian refugees in Syria to return to the West Bank, President Mahmoud Abbas said in an interview with Al-Mayadeen satellite channel. Abbas rejected an Israeli condition which would force refugees to sign a statement saying that they would give up the right of return to Israel, according to The Associated Press. Yes. At any time over the last almost 70 years, Israel could have repatriated all the refugees from the geographic region defined by its (Partition) borders. Israel could also have ended its occupation and colonization of Palestine so that a Palestinian state could emerge and repatriate all the refugees from the geographic region defined by its (Partition) borders. Same applies to the Free City of Jerusalem. Well, apparently the camp is/was on the side of the Syrian rebels, else they wouldn’t have been sieged by the government. Rather than a plea for help on behalf of war refugees, isn’t this rather a call for support from an armed faction in the Syrian civil war? Now everyone including the Palestinian National Authority is seriously preoccupied with Yarmuk. A couple of months back, the Palestinian leadership marched in the Charlie Hebdo jamboree in Paris but not a word was mentioned about the plight of the Palestinians in Yarmuk. Come to think of it, the 2200 dead Palestinians of Gaza 2014 didn’t get a dinner either. Walid, so now that we figured how a caliph can pop out like a jack-in-the-box, the question remains – what turns the PA buttons on and off? couldn’t possibly be something greasy that can make up for withheld tax monies? well, you probably know more about the strange happenstances in that part of the world than I do. One really hates to be cynical when real people are suffering. I just wish more saw through the cynical manipulations by certain powers and had the gumption it takes to resist. I reckon some do, perhaps even many. They are just not the ones in the headlines. “The Presbyterian Church (USA) has removed a controversial publication from its website that was targeted by prominent Jewish organizations and church members as being an attack against Israel. “The 76-page booklet, “Zionism Unsettled: A Congregational Study Guide,” was released in January by the Israel/Palestine Mission Network, an independent Presbyterian group. Since then, it had increasingly become a focal point of criticism against the church in heated debates leading to a vote last week to divest from select companies whose products are used in Israel and the Palestinian territories. “The guide, which was created as a resource for churches discussing issues in the Middle East, calls Zionism a “false theology” and was never officially endorsed by the church. Meeting in Detroit last week, the church’s biennial General Assembly declared that it “does not represent the views of the Presbyterian Church (U.S.A.).” But groups including the Anti-Defamation League, Union for Reform Judaism and American Jewish Committee had strongly criticized the document, particularly because the church was selling it despite distancing itself from its positions. “Anti-divestment Jewish organizations and Presbyterian groups had pointed to the guide’s sale as evidence that the church had taken anti-Israeli and anti-Jewish positions. “The booklet can continue to be independently sold, but not on the church’s website, according to a church statement. “The divestment vote, which passed 310-303 at the assembly, will lead to Presbyterians selling $21 million in shares in Hewlett-Packard, Motorola and Caterpillar Inc. The assembly said it voted for divestment because of how the companies’ products are used in violence, checkpoints and settlement building in occupied Palestinian territories. That’ll do a lot of good. Thanks for that, Boomer. Thank god I ordered two. ;-) Lot of nerve to accuse the church of anti-semitism and anti-jewishness for selling the doc and dvd. What do they sell their fundraising plates for? 50Gs a pop?